Sonoma County is in the northern part of the greater San Francisco Bay region, an area of Northern California that has experienced rapid population growth and accelerated urbanization in response to economic expansion over the past few decades. The large increase in population and concomitant changes in land use within Sonoma County require reassessment of the water resources and how best to manage them for optimal utilization over the next few decades. Most basins in the county currently rely on a combination of Russian River water and native ground water to meet demand. Recycled water is used on a limited basis. In addition, water conservation programs have been implemented and are being expanded. The Sonoma Valley is a well-defined hydrologic basin in southeastern Sonoma County. The basin has some areas of declining ground-water levels, potential water-quality problems from seawater intrusion and upwelling of geothermal waters, and ground-water/surface-water interaction. Location of the Study Area The study area is located approximately 30 miles (mi) northeast of San Francisco and includes the entire Sonoma Creek watershed in southeastern Sonoma County, California (fig. 1). The study focused on the area of the valley floor and the adjacent hills where most of the urban development and irrigated agriculture have been occurring. The watershed includes approximately 166 square miles (mi2) of land that drains by way of Sonoma Creek and its tributaries to San Pablo Bay (fig. 2), which is the northern arm of the San Francisco Bay. The Sonoma Mountains form the southwestern side of the watershed and the Mayacmas Mountains form the northeastern side. Between these two mountain ranges lies the northwest trending elongate depression of Sonoma Valley, which extends roughly 20 mi from the shore of San Pablo Bay to near Kenwood (fig. 2). Purpose and Scope: The U.S. Geological Survey (USGS), in cooperation with the Sonoma County Water Agency (SCWA), undertook this study to evaluate the ground-water resources of Sonoma Valley and to develop a tool to better understand and manage the ground-water system. The goals of the study were to update the geohydrologic characterization of the study area; to provide a current assessment of hydrologic conditions, including a description of historical ground-water level and waterquality changes; and to provide water-supply agencies with a ground-water flow model that can be used as a planning tool for water-resources assessment and management. To meet the objectives of this study, four principal tasks were identified: (1) evaluation of existing geohydrologic, geophysical, and geochemical data; (2) collection and analysis of new geohydrologic data, including subsurface lithologic data, gravity measurements, ground-water levels, and streamflow gains and losses; (3) collection and analysis of new water chemistry, temperature, and isotopic data; and (4) development a ground-water flow model. 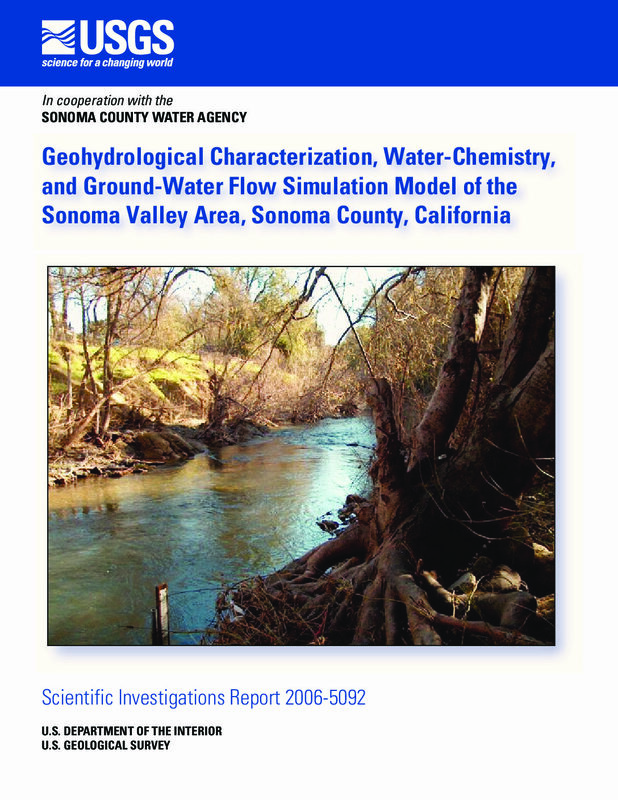 This report provides a geologic and hydrologic description of the area, presents selected hydrologic data collected from the 1970s to 2004, quantifies historical changes in the ground-water system, documents a ground-water flow simulation model, and presents an interpretation of surface geophysical data that help define the geometry of the ground-water reservoir.